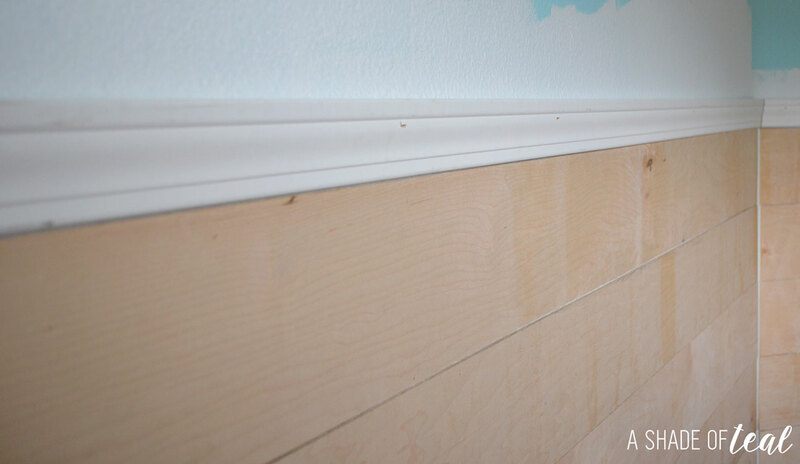 Another Faux Shiplap tutorial! 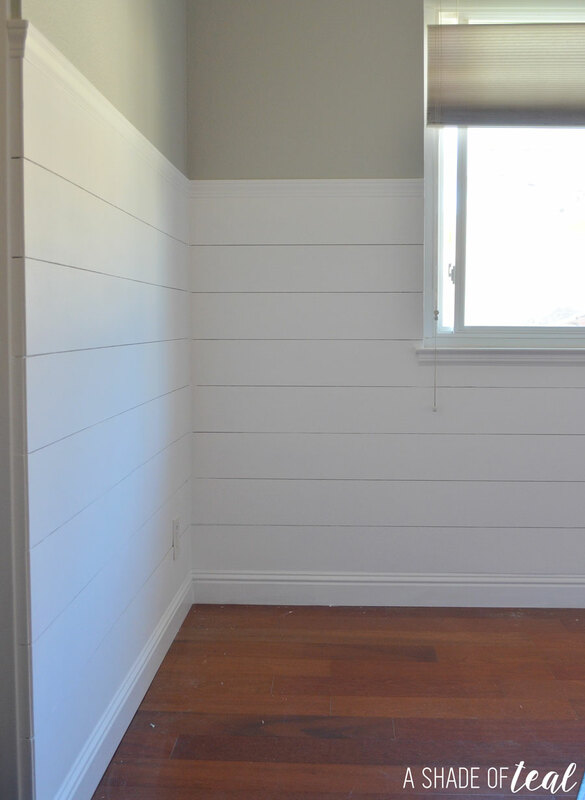 I’m becoming quite obsessed with shiplap and how it adds so much dimension to a room. My “Rustic Glam Nursery” is the 3rd room in my house that I’ve added it to. You can see my entire Nursery HERE. I last gave a tutorial for my Office. For that room I only did 1 accent wall. You can check out the full office reveal HERE. For my “Rustic Glam Nursery” I decided to add shiplap to the entire room but only half way up. Window or Door Casing 2 1/2” wide, I needed about 5 pieces for my room. The first step is to cut/rip the plywood into 6″ wide strips. I had Lowe’s do it for me. I lightly sanded the edges before installing. I prepped my walls with a coat of primer since they were aqua and I didn’t want the color to show through. I then installed my 1st piece right above the existing base molding. You can see below that my 1st piece required me to cut out a notch for the outlet. I just used a chisel and hammered the wood to get the notch. Sorry, no pics here; but since the wood is only 1/4″ thick this method works really easy. 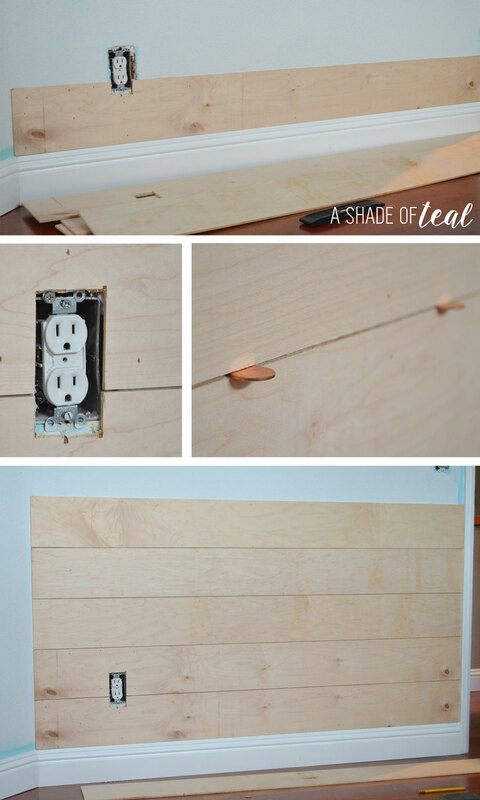 Plus, keep in mind it doesn’t need to be a clean cut since your outlet cover will cover it. Next, I used pennies to act as a spacer. Once the first 2 pieces were up the rest was easy. For where the corners met I tried to place the wood as close together as possible. I didn’t use any extra molding for the seams but you can easily add it. I kept adding the plywood strips to the rest of the room on all walls. I made each wall 8 strips tall. Next, I added the door/window case molding to the top of the shiplap. At this point I like to back around the entire room to make sure none of the plywood was loose or separating from the wall. If your using too short of nails you’ll definitely have this problem. Once everything is secure its time to Spackle the nail holes and caulk all the seams. I also caulked all the corner seams. This can be incredibly tedious and you don’t have to do it if you like the worn & weathered look, but I prefer the clean look when it’s all done. After the Spackle is dry I used the sanding blocks to sand any excess Spackle off. 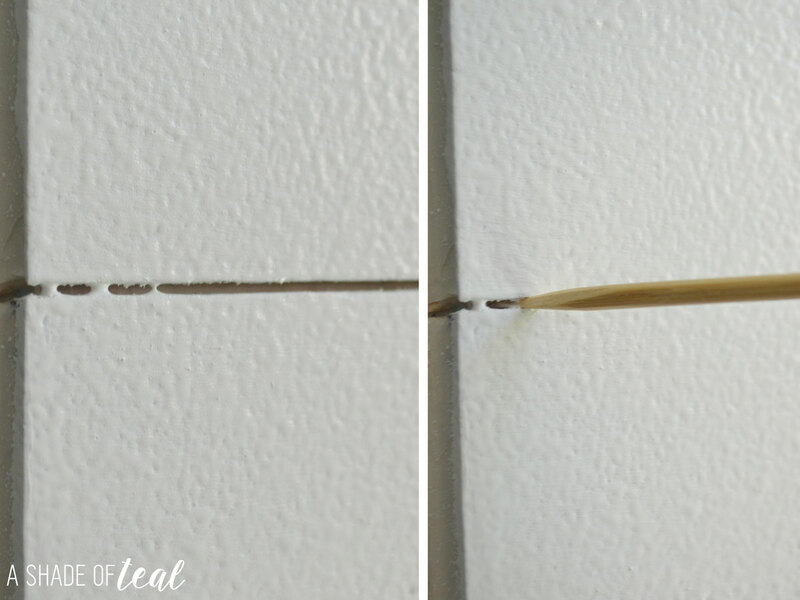 You’ll want to make sure the caulk is completely dry before painting. Time to paint! I used Valspar Signature Flat Latex Interior Paint – Bistro White. 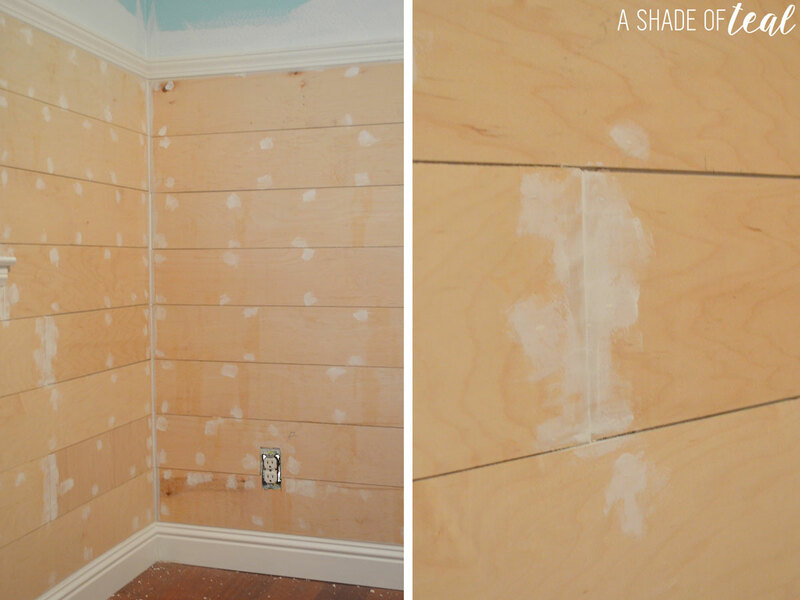 I have 2 tips for painting the shiplap. First, if you use a roller then this extra texture might happen. So I would roll a couple rows then quickly used a paint brush to make it smooth. 2nd tip is to use a skewer stick or toothpick to get the paint out of the seams. Here’s 1 wall all painted white. I kept painting the shiplap and needed 1 coat plus some touch ups. For my walls I used Valspar Signature Flat Latex Interior Paint – Notre Dame (Grey). Here’s the shiplap all complete. Check out my entire “Rustic Glam Nursery” HERE, or my Office reveal HERE. 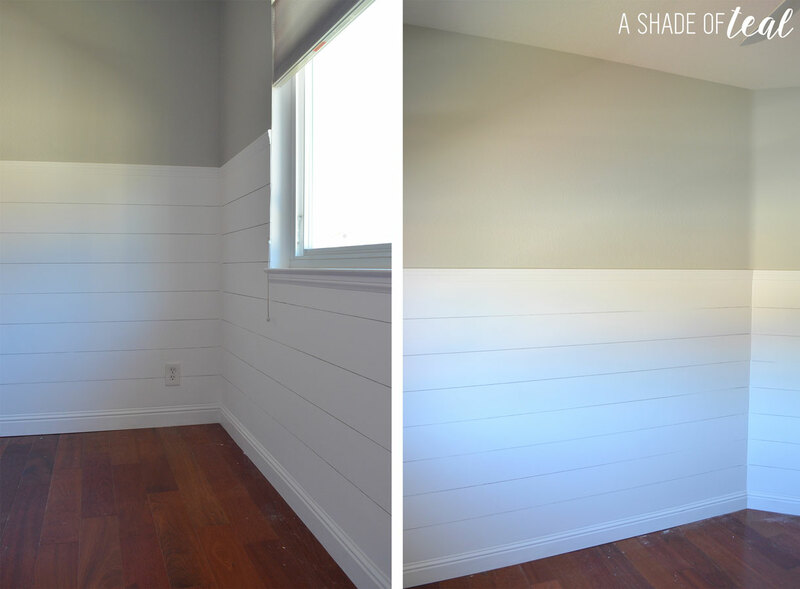 If you want to see my office shiplap tutorial you can see that post HERE. 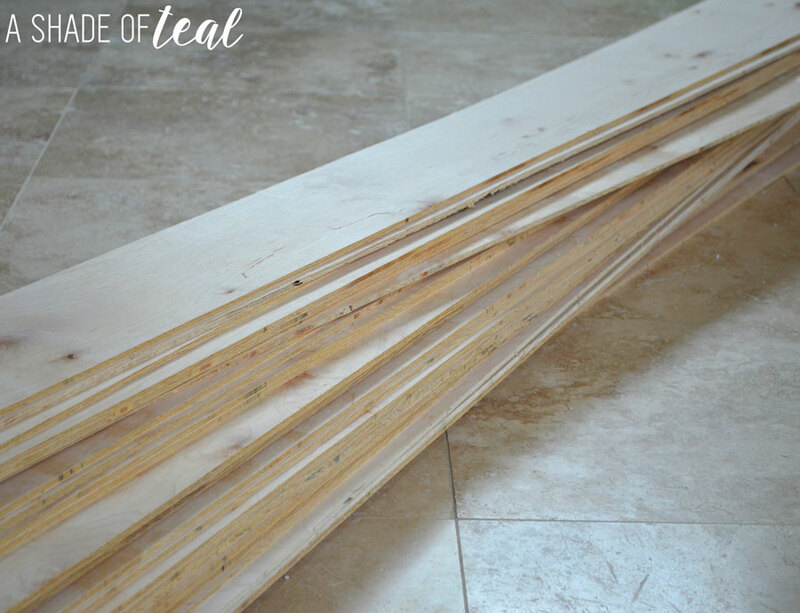 One question about the edges of the plywood – if you don’t paint them white before installing, do you notice it once on the wall? I guess the gaps between the strips create a shadow but was wondering if you notice the edges aren’t white? Thanks! Hi Farrah- No you really don’t notice it. But some spots that would be more obvious I made sure to paint in-between the strips once they were on the wall. Great post thanks! I did pre-paint my boards after reading over your tutorial! It sure made the job easier! Love your blog too! 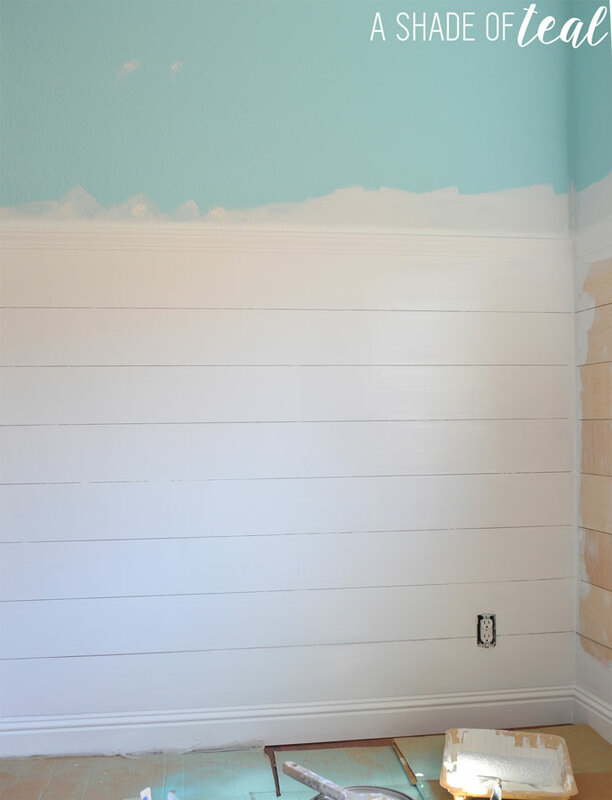 Love this shiplap idea! Thank you for posting it. I was wondering how you managed to get the pennies in between the boards? Did someone help you hold the board while you put the pennies in between? Thank you. Love your blog! I want to start D.I.Y.’ing so I can save money.